Celtic beat Aberdeen for the third time in 10 days and in doing so moved eight points clear of Rangers at the top of the Scottish Premier League. Andrew Considine was sent off within two minutes for fouling Celtic's Scott Brown but Jamie Langfield saved Anthony Stokes' resultant penalty. Gary Hooper and Stokes combined for two of Celtic's three goals, the former finishing a one-two for the opener. Mark Wilson headed a 75th-minute second and Hooper fed Stokes for the third. The match could scarcely have begun more dramatically. Dons boss Craig Brown had just finished shaking hands with his Celtic counterpart Neil Lennon when Hooper picked out Brown making a run into the box. Hooper's delicious cross-field pass was controlled and nudged towards goal by the Celtic captain in a flowing move, but as Brown shaped to score he was hauled down by Andrew Considine and referee Alan Muir pointed to the spot. While Stokes grabbed the ball for the penalty, Muir presented the shell-shocked Dons defender with a red card and his involvement was over after 95 seconds. Considine's foul was apparent but Aberdeen could argue that a yellow card was sufficient as Zander Diamond was racing across to cover. Jamie Langfield did not have the best of games against Celtic at Hampden in the 4-1 Co-operative Insurance Cup semi-final defeat, but he denied Stokes a penalty goal with a dive to his left - an inspirational save. But Celtic could smell blood and they tore the Reds apart in the 12th minute. Quick-thinking Hooper worked a one-two with strike partner Stokes, raced past a static Aberdeen defence and slid the ball beyond Langfield for his 11th Scottish Premier League goal. Worse was to follow for the home side. Ryan Jack had started the match in midfield in favour of Derek Young but had moved into defence with Considine's sending-off. Soon he was hobbling off injured at the same time as David McNamee, who had switched from right- to left-back, was wincing in pain with a groin injury. Brown threw on Derek Young and new loan signing Steven Smith for the duo as Aberdeen's decimated defence contemplated a long evening. Celtic's Kris Commons had looked lively, firing over the bar after 10 minutes, and tested Langfield twice more with his left foot in the first half. He smacked a first-time shot at the Dons goal that was well saved in 22 minutes, and 10 minutes later the Aberdeen keeper was down smartly to his right to turn the former Derby player's shot round the post. The pressure on the Dons goal was constant. Brown blasted a shot at goal that Zander Diamond blocked with a combination of head then arm, then Beram Kayal stole into space 25 yards out and curled a powerful shot around Langfield that cracked off the inside of the post. Aberdeen's Rob Milsom cleared off his goal-line with Stokes ready to pounce before Aberdeen made a late first-half rally. Nick Blackman had three Celtic players puzzled when he left them in his wake with a 180-degree turn and shot just wide in 38 minutes, then Chris Maguire belted a first-time angled volley that stung Fraser Forster's palms. Reaching half-time a goal down was an achievement for Aberdeen. They would have been level in 42 minutes had Forster not been alert to a sweet volley by Scott Vernon from eight yards as he connected with a corner. While Celtic have been consistent in racking up the SPL points, their defence has been shorn of any sort of pattern. Efrain Juarez, Mark Wilson, Charlie Mulgrew and Emilio Izaguirre were in at the back, with Glenn Loovens, Thomas Rogne and Daniel Majstorovic injured and Darren O'Dea and Jos Hooiveld out on loan. Aberdeen worked hard to limit the chances in the first 20 minutes of the second half; enough, indeed, for Lennon to withdraw Kayal for Paddy McCourt to try to increase Celtic's attacking intent. In 66 minutes the pacy Commons evaded a desperate challenge by Smith, rounded Langfield then struck the post when he ought to have rolled the ball into the net. Wilson's last goal was five years ago but it was the defender who eased Celtic's nerves that they may be stung by Aberdeen when he rose to meet Commons' in-swinging corner. His powerful header from six yards gave Langfield no chance at all. The Dons were three goals down after as many minutes had passed since Wilson's header. Hooper was running away from goal in the Aberdeen box but managed to find his strike partner Stokes, who cut on to his left foot and shot between Langfield and his near post. Celtic are unbeaten in 12 league games and are applying pressure to their title rivals. 90:00+1:53 Shot by Scott Vernon (Aberdeen) drilled right-footed from left channel (20 yards), comfortable save (caught) by Fraser Forster (Celtic). 90:00+1:03 Foul by Paul Hartley (Aberdeen) on Kris Commons (Celtic). Free kick taken right-footed by Mark Wilson (Celtic) from right channel, resulting in open play. 90:00+0:09 Cross by Scott Vernon (Aberdeen), resulting in open play. 88:17 Shot by Charlie Mulgrew (Celtic) right-footed from left channel (35 yards), missed left. Goal kick taken long by Jamie Langfield (Aberdeen). 87:41 Foul by Chris Maguire (Aberdeen) on Charlie Mulgrew (Celtic). Free kick taken right-footed by Fraser Forster (Celtic) from own half, resulting in open play. 86:41 Inswinging corner from left by-line taken right-footed by Chris Maguire (Aberdeen) to centre, clearance by Mark Wilson (Celtic). 86:41 Booking Charlie Mulgrew (Celtic) booked for unsporting behaviour. 84:08 Substitution Celtic substitution: Scott Brown replaced by Lewis Toshney (tactical). 82:15 Cross by Daryl Murphy (Celtic), clearance by Zander Diamond (Aberdeen). 81:42 Foul by Chris Maguire (Aberdeen) on Scott Brown (Celtic). Free kick taken right-footed by Efrain Juarez (Celtic) from right channel, passed. 81:10 Attacking throw-in by Efrain Juarez (Celtic). 80:34 Defending throw-in by Efrain Juarez (Celtic). 80:10 Defending throw-in by Emilio Izaguirre (Celtic). 79:53 Goal kick taken long by Jamie Langfield (Aberdeen). 78:55 Inswinging corner from right by-line taken left-footed by Kris Commons (Celtic) to centre, clearance by Scott Vernon (Aberdeen). 78:55 Substitution Celtic substitution: Anthony Stokes replaced by Daryl Murphy (tactical). 77:23 Assist (pass) by Gary Hooper (Celtic) from right by-line. 77:23 GOAL - Anthony Stokes:Aberdeen 0 - 3 Celtic Goal by Anthony Stokes (Celtic) right-footed (bottom-right of goal) from right side of penalty area (18 yards).Aberdeen 0-3 Celtic. 77:00 Substitution Aberdeen substitution: Nick Blackman replaced by Peter Pawlett (tactical). 76:27 A cross is delivered by Nick Blackman, Mark Wilson makes a clearance. Paul Hartley produces a left-footed shot from just outside the penalty area that goes harmlessly over the target. Correction - 76:06 The ball is crossed by Nick Blackman, clearance made by Mark Wilson. Shot from just outside the box by Paul Hartley goes over the bar. 76:06 Cross by Nick Blackman (Aberdeen), clearance by Mark Wilson (Celtic). Attacking throw-in by Nick Blackman (Aberdeen). Shot by Paul Hartley (Aberdeen) volleyed left-footed from left channel (20 yards), over the bar. Goal kick taken long by Fraser Forster (Celtic). 75:30 Defending throw-in by Steven Smith (Aberdeen). 74:37 Inswinging corner from right by-line taken left-footed by Kris Commons (Celtic) to centre, assist (cross) by Kris Commons (Celtic) from right by-line. 74:37 GOAL - Mark Wilson:Aberdeen 0 - 2 Celtic Goal by Mark Wilson (Celtic) left-footed (top-right of goal) from right side of six-yard box (6 yards).Aberdeen 0-2 Celtic. 71:45 Cross by Emilio Izaguirre (Celtic), clearance by Zander Diamond (Aberdeen). Corner from left by-line taken short right-footed by Scott Brown (Celtic). Shot by Patrick McCourt (Celtic) drilled right-footed from left channel (20 yards), missed left. Goal kick taken long by Jamie Langfield (Aberdeen). 69:53 Foul by Emilio Izaguirre (Celtic) on Chris Maguire (Aberdeen). Free kick taken right-footed by Chris Maguire (Aberdeen) from right channel, resulting in open play. 69:25 Defending throw-in by Derek Young (Aberdeen). 69:08 Attacking throw-in by Emilio Izaguirre (Celtic). 68:22 Foul by Paul Hartley (Aberdeen) on Joe Ledley (Celtic). Free kick crossed left-footed by Kris Commons (Celtic) from right channel, clearance by Rory McArdle (Aberdeen). 68:13 Attacking throw-in by Efrain Juarez (Celtic). 66:05 Shot by Kris Commons (Celtic) left-footed from left side of six-yard box (6 yards), goal kick taken long by Jamie Langfield (Aberdeen). 64:44 Foul by Chris Maguire (Aberdeen) on Mark Wilson (Celtic). Free kick crossed right-footed by Charlie Mulgrew (Celtic) from right channel, comfortable save (caught) by Jamie Langfield (Aberdeen). Defending throw-in by Efrain Juarez (Celtic). 64:44 Substitution Celtic substitution: Beram Kayal replaced by Patrick McCourt (tactical). 63:25 Booking Chris Maguire (Aberdeen) booked for unsporting behaviour. 62:00 Attacking throw-in by Efrain Juarez (Celtic). 60:58 Shot by Robert Milsom (Aberdeen) drilled right-footed from left channel (20 yards), missed right. Goal kick taken long by Fraser Forster (Celtic). 60:21 Foul by Scott Brown (Celtic) on Chris Maguire (Aberdeen). Free kick taken left-footed by Steven Smith (Aberdeen) from left channel, resulting in open play. 59:54 Attacking throw-in by Steven Smith (Aberdeen). 58:54 Foul by Scott Vernon (Aberdeen) on Emilio Izaguirre (Celtic). Free kick taken left-footed by Charlie Mulgrew (Celtic) from own half, resulting in open play. 58:54 Booking Scott Vernon (Aberdeen) booked for unsporting behaviour. 58:13 Defending throw-in by Emilio Izaguirre (Celtic). 57:15 Foul by Chris Maguire (Aberdeen) on Mark Wilson (Celtic). Free kick crossed left-footed by Kris Commons (Celtic) from right channel, clearance by Steven Smith (Aberdeen). 56:13 Foul by Scott Vernon (Aberdeen) on Joe Ledley (Celtic). Free kick taken left-footed by Emilio Izaguirre (Celtic) from own half, passed. 55:52 Cross by Steven Smith (Aberdeen), clearance by Mark Wilson (Celtic). 55:07 Foul by Mark Wilson (Celtic) on Chris Maguire (Aberdeen). Free kick taken left-footed by Steven Smith (Aberdeen) from own half, resulting in open play. 54:48 Defending throw-in by Steven Smith (Aberdeen). 54:02 Chris Maguire (Aberdeen) caught offside. Free kick taken right-footed by Fraser Forster (Celtic) from own half, resulting in open play. Defending throw-in by Emilio Izaguirre (Celtic). 53:34 Cross by Kris Commons (Celtic), resulting in ball out of play. Defending throw-in by Steven Smith (Aberdeen). 52:41 Shot by Kris Commons (Celtic) drilled left-footed from left side of penalty area (12 yards), missed left. Goal kick taken long by Jamie Langfield (Aberdeen). 52:01 Defending throw-in by Efrain Juarez (Celtic). 51:52 Attacking throw-in by Steven Smith (Aberdeen). 51:39 Attacking throw-in by Steven Smith (Aberdeen). 51:02 Cross by Emilio Izaguirre (Celtic), resulting in ball out of play. Goal kick taken long by Jamie Langfield (Aberdeen). 49:55 Foul by Emilio Izaguirre (Celtic) on Paul Hartley (Aberdeen). Free kick taken left-footed by Jamie Langfield (Aberdeen) from own half, resulting in open play. 49:19 Inswinging corner from right by-line taken left-footed by Kris Commons (Celtic) to short, resulting in open play. 48:53 Attacking throw-in by Emilio Izaguirre (Celtic). 47:26 Foul by Paul Hartley (Aberdeen) on Efrain Juarez (Celtic). Free kick taken right-footed by Fraser Forster (Celtic) from own half, resulting in open play. 47:26 Booking Paul Hartley (Aberdeen) booked for dissent. 46:43 Inswinging corner from left by-line taken right-footed by Chris Maguire (Aberdeen) to near post, clearance by Mark Wilson (Celtic). 45:59 Foul by Gary Hooper (Celtic) on Zander Diamond (Aberdeen). Free kick taken left-footed by Jamie Langfield (Aberdeen) from own half, resulting in open play. 45:40 Defending throw-in by Emilio Izaguirre (Celtic). 45:15 Defending throw-in by Derek Young (Aberdeen). 45:00+2:16 The ref blows to end the first period. 45:00+1:48 Defending throw-in by Efrain Juarez (Celtic). 45:00+1:17 Anthony Stokes (Celtic) caught offside. Free kick taken left-footed by Jamie Langfield (Aberdeen) from own half, resulting in open play. 45:00+0:43 Foul by Robert Milsom (Aberdeen) on Scott Brown (Celtic). Free kick taken left-footed by Mark Wilson (Celtic) from own half, passed. 45:00+0:24 Defending throw-in by Efrain Juarez (Celtic). 44:01 Foul by Zander Diamond (Aberdeen) on Anthony Stokes (Celtic). Free kick curled right-footed by Anthony Stokes (Celtic) from right channel (25 yards), over the bar. Goal kick taken long by Jamie Langfield (Aberdeen). 43:33 Attacking throw-in by Emilio Izaguirre (Celtic). 41:59 Foul by Gary Hooper (Celtic) on Rory McArdle (Aberdeen). Free kick taken right-footed by Rory McArdle (Aberdeen) from own half, resulting in open play. 40:49 Inswinging corner from right by-line taken left-footed by Robert Milsom (Aberdeen) to far post, shot by Rory McArdle (Aberdeen) volleyed right-footed from left side of six-yard box (6 yards), blocked by Mark Wilson (Celtic). Goal kick taken long by Fraser Forster (Celtic). 40:13 Attacking throw-in by Steven Smith (Aberdeen). 39:39 Foul by Nick Blackman (Aberdeen) on Joe Ledley (Celtic). Free kick taken left-footed by Charlie Mulgrew (Celtic) from own half, resulting in open play. 39:26 Defending throw-in by Paul Hartley (Aberdeen). 38:49 Shot by Chris Maguire (Aberdeen) volleyed right-footed from right side of penalty area (18 yards), save (caught) by Fraser Forster (Celtic). 37:55 Shot by Nick Blackman (Aberdeen) right-footed from left channel (25 yards), missed left. Goal kick taken long by Fraser Forster (Celtic). 37:15 Foul by Anthony Stokes (Celtic) on Zander Diamond (Aberdeen). Free kick taken left-footed by Jamie Langfield (Aberdeen) from own half, resulting in open play. 36:28 Shot by Beram Kayal (Celtic) drilled left-footed from right channel (30 yards), goal kick taken long by Jamie Langfield (Aberdeen). 36:11 Attacking throw-in by Scott Brown (Celtic). 35:27 Attacking throw-in by Efrain Juarez (Celtic). 31:59 Shot by Kris Commons (Celtic) left-footed from right side of penalty area (12 yards), fantastic save (parried) by Jamie Langfield (Aberdeen). Outswinging corner from left by-line taken left-footed by Kris Commons (Celtic) to near post, clearance by Zander Diamond (Aberdeen). Shot by Emilio Izaguirre (Celtic) drilled right-footed from left channel (30 yards), missed left. Goal kick taken long by Jamie Langfield (Aberdeen). 31:08 Foul by Emilio Izaguirre (Celtic) on Chris Maguire (Aberdeen). Free kick crossed left-footed by Robert Milsom (Aberdeen) from right wing, comfortable save (caught) by Fraser Forster (Celtic). 30:41 Defending throw-in by Steven Smith (Aberdeen). 29:51 Foul by Derek Young (Aberdeen) on Kris Commons (Celtic). Free kick taken left-footed by Charlie Mulgrew (Celtic) from own half, resulting in open play. 29:51 Booking Derek Young (Aberdeen) booked for unsporting behaviour. 29:20 Defending throw-in by Derek Young (Aberdeen). 27:03 Foul by Paul Hartley (Aberdeen) on Beram Kayal (Celtic). Free kick taken right-footed by Mark Wilson (Celtic) from own half, passed. 26:18 Foul by Efrain Juarez (Celtic) on Robert Milsom (Aberdeen). Free kick crossed right-footed by Paul Hartley (Aberdeen) from left channel, clearance by Charlie Mulgrew (Celtic). 25:29 Foul by Zander Diamond (Aberdeen) on Anthony Stokes (Celtic). Free kick taken right-footed by Efrain Juarez (Celtic) from right channel, passed. 24:53 Cross by Beram Kayal (Celtic), comfortable save (caught) by Jamie Langfield (Aberdeen). 24:06 Defending throw-in by Emilio Izaguirre (Celtic). 23:48 Shot by Scott Brown (Celtic) drilled left-footed from right channel (18 yards), comfortable save (caught) by Jamie Langfield (Aberdeen). 21:30 Outswinging corner from right by-line taken right-footed by Scott Brown (Celtic) to near post, clearance by Rory McArdle (Aberdeen). Shot by Kris Commons (Celtic) drilled right-footed from left channel (20 yards), save (caught) by Jamie Langfield (Aberdeen). 21:07 Defending throw-in by Efrain Juarez (Celtic). 20:19 Defending throw-in by Derek Young (Aberdeen). 19:44 Cross by Nick Blackman (Aberdeen), resulting in ball out of play. Goal kick taken long by Fraser Forster (Celtic). 18:37 Inswinging corner from right by-line taken right-footed by Kris Commons (Celtic) to far post, clearance by Zander Diamond (Aberdeen). Anthony Stokes (Celtic) caught offside. Free kick taken left-footed by Jamie Langfield (Aberdeen) from own half, resulting in open play. 18:13 Attacking throw-in by Scott Brown (Celtic). 17:29 Substitution Aberdeen substitution: David McNamee replaced by Steven Smith (injury). 17:19 Attacking throw-in by Emilio Izaguirre (Celtic). 16:40 Joe Ledley (Celtic) caught offside. Free kick taken left-footed by Jamie Langfield (Aberdeen) from own half, resulting in open play. 15:35 Foul by Chris Maguire (Aberdeen) on Kris Commons (Celtic). Free kick taken left-footed by Fraser Forster (Celtic) from left channel, resulting in open play. 15:35 Substitution Aberdeen substitution: Ryan Jack replaced by Derek Young (tactical). 15:07 Scott Vernon (Aberdeen) caught offside. Free kick taken right-footed by Mark Wilson (Celtic) from own half, resulting in open play. 14:39 Anthony Stokes (Celtic) caught offside. Free kick taken left-footed by Jamie Langfield (Aberdeen) from own half, resulting in open play. 11:52 Assist (pass) by Anthony Stokes (Celtic) from left side of penalty area. 11:52 GOAL - Gary Hooper:Aberdeen 0 - 1 Celtic Goal by Gary Hooper (Celtic) right-footed (bottom-right of goal) from centre of penalty area (6 yards).Aberdeen 0-1 Celtic. 10:49 Cross by Paul Hartley (Aberdeen), resulting in ball out of play. Goal kick taken long by Fraser Forster (Celtic). 10:37 Attacking throw-in by David McNamee (Aberdeen). 10:25 Attacking throw-in by Efrain Juarez (Celtic). 9:39 Shot by Kris Commons (Celtic) left-footed from left channel (20 yards), missed left. Goal kick taken long by Jamie Langfield (Aberdeen). 8:20 Attacking throw-in by Efrain Juarez (Celtic). 6:58 Defending throw-in by Efrain Juarez (Celtic). Correction - 6:28 Joe Ledley challenges Scott Vernon unfairly and gives away a free kick. Jamie Langfield takes the direct free kick. 6:28 Foul by Joe Ledley (Celtic) on Scott Vernon (Aberdeen). Free kick taken left-footed by Jamie Langfield (Aberdeen) from own half, resulting in open play. 5:53 Foul by Ryan Jack (Aberdeen) on Joe Ledley (Celtic). Free kick taken right-footed by Mark Wilson (Celtic) from left channel, resulting in open play. 5:12 Defending throw-in by Nick Blackman (Aberdeen). 4:52 Defending throw-in by Ryan Jack (Aberdeen). 4:34 Shot by Paul Hartley (Aberdeen) volleyed right-footed from left channel (20 yards), blocked by Mark Wilson (Celtic). 4:18 Attacking throw-in by Nick Blackman (Aberdeen). 4:08 Cross by Ryan Jack (Aberdeen), clearance by Mark Wilson (Celtic). 3:49 Attacking throw-in by David McNamee (Aberdeen). 2:32 Inswinging corner from right by-line taken left-footed by Kris Commons (Celtic) to near post, clearance by Zander Diamond (Aberdeen). Goal kick taken long by Jamie Langfield (Aberdeen). 2:32 Placed penalty taken right-footed by Anthony Stokes (Celtic) (bottom-right of goal), save (parried) by Jamie Langfield (Aberdeen). 1:35 Foul by Andrew Considine (Aberdeen) on Scott Brown (Celtic). 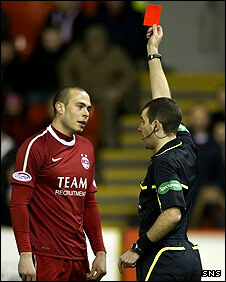 1:35 Sent off Andrew Considine (Aberdeen) dismissed for professional foul. 0:37 Defending throw-in by David McNamee (Aberdeen). 0:06 Defending throw-in by Efrain Juarez (Celtic).